I have been subscribing to Vegetarian Times magazine for several years now, and I am pretty sure I just renewed my subscription. This is somewhat peculiar, because I believe I have mentioned here before that I have yet to make a recipe from the magazine that worked out for me. So why do I keep subscribing? A combination of factors, I guess. I want to support them, even though I am not a vegetarian. I think too many of their recipes try too hard to imitate meat dishes, and I am not interested in meat substitutes. I think even if I were a vegetarian I would avoid meat substitutes. It may be just me, but I think if I were to decide to stop eating meat again I would avoid dishes that were made to replicate meat dishes. Even though there's no actual meat in a Chik'n Patty, it would feel like cheating to me to eat one if I were not eating meat. But then again, I do eat meat, so I know I am not in the best position to judge. What else keeps me loyal to this magazine? I support most of the peripheral ideas that the magazine represents: whole foods, organic foods, sustainability, and information on companies who are walking the walk or just talking the talk. 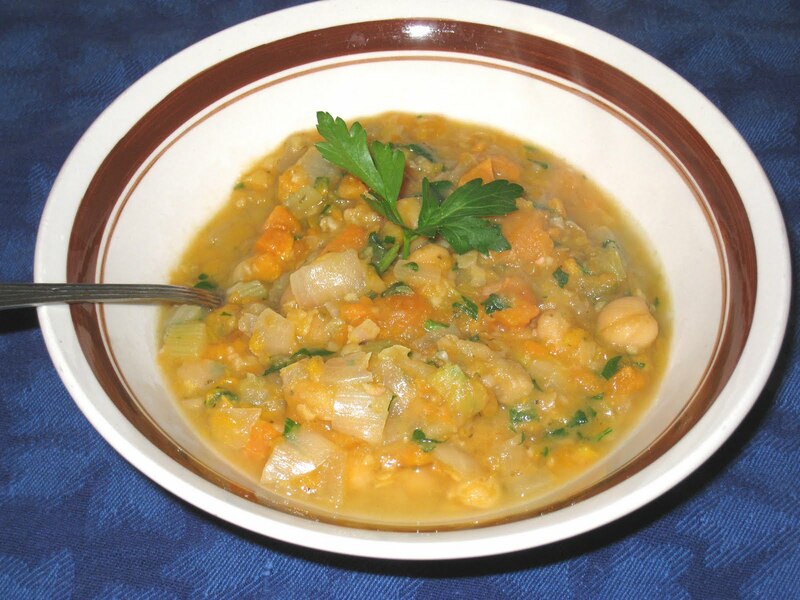 So even though it is unlikely that I will ever give up meat, I don't eat it every day and I am always looking for healthy, hearty vegetarian fare. But I think I will have to avoid the recipes in future. This Italian Chickpea Soup is a good illustration of my dilemma. It was in the November 2009 issue, and was a reprint of a 1993 version, revised - "our 2009 taste buds wanted more spice," and is now available online. Here is the original version. I have mentioned before that one of the issues I have with most of the recipes I have tried from the magazine is that they call for too much spice. And I am a person who believes that if a little bit of spice is nice, more spice is better. 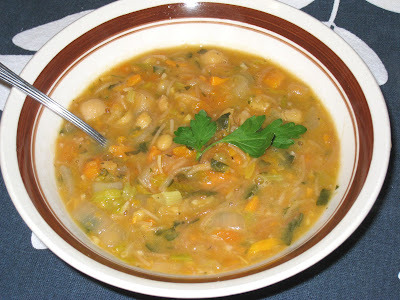 The thyme and oregano in this recipe completely overpowered the more subtle flavors of the chickpeas and the vegetable broth. I did cut the recipe in half, but I also cut the spices in half so that shouldn't have been a problem. The other problem I had with this recipe is that the sweetness of the sweet potato also overpowered the chickpeas and the vegetable broth and competed with the thyme and oregano in my mouth, with an overall unpleasant result. The soup was also much thicker than I thought it would be, and I was not satisfied with it. So I decided to play with it. I so enjoyed the Tunisian Soup with Chard and Egg Noddles that I made a few weeks ago that I bought a bag of vermicelli I found at the Middle East Baker and Grocery store that is right down the street from where I work. 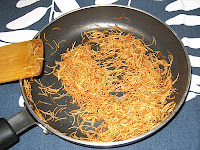 I thought adding the noddles might help tame the competing flavors of the sweet potato and the herbs. 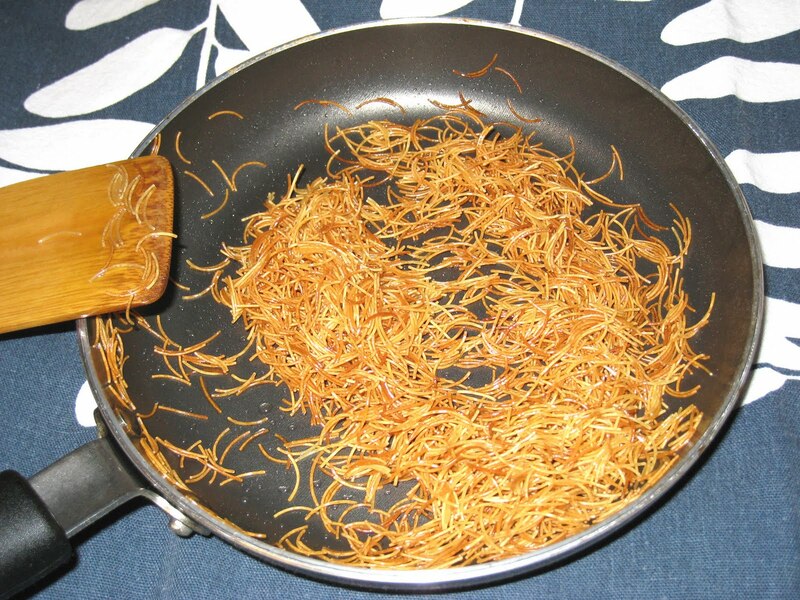 I read that it is a good idea to toast the vermicelli before you cook it, so I put a little oil (a little too much as it turns out; I did use less than a tablespoon, but a teaspoon would have been perfect). It didn't take long to start turning toasty brown. As it was browning I realized I was halfway toward making Rice-a-Roni - add rice, water and spices and there you are. I guess I'll be working on that soon. Who knew all of these "convenience" foods could be made so conveniently without opening a single box? I added two more cups of water to the soup, both to thin it and to compensate for the 1/2 cup of vermicelli noodles I was adding. It did mellow out the flavors, but it was still a little too sweet. I added a splash of white wine vinegar and it did brighten up the pot, but it still seemed to be lacking a depth of flavor. Hmmmm. What else could I add? I didn't want to end up with one of those situations where I end up adding a little bit of everything in the kitchen and having it taste like mud. What could bring all of these flavors together? DIY Worcestershire sauce to the rescue! I added a teaspoon, stirred it in, and that seemed to do the trick. I don't know what it is about the recipes in Vegetarian Times that makes them not work for me. I will admit that I am a recipe adjuster - I rarely follow a recipe exactly as written. But I have also been cooking for a long time now and my instincts and knowledge are pretty good about what will work and what won't. I do not have this problem with recipes from most other sources, so I do not think that is the reason why I have not yet found a recipe from there that I liked. Perhaps the fact that I do eat meat makes these dishes taste different to me than they would to someone who does not eat meat. But I make plenty of vegetarian dishes from other sources, and again, I do not have this problem. But I cannot help but wonder, is it me or is it them?